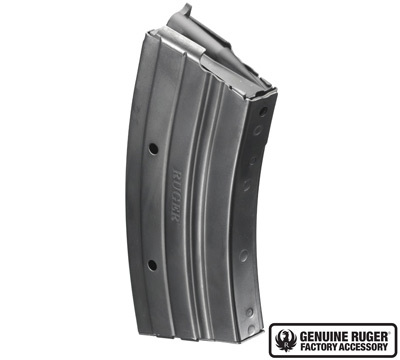 Blued steel, 20-Round, 7.62x39mm magazine for the Ruger® Mini Thirty® and Ruger American Rifle® Ranch in 7.62x39. Ruger cannot bill to or ship 20-round magazines to the following states and cities: California, Colorado, Connecticut, Hawaii, Maryland, Massachusetts, New York, New Jersey, Vermont, Washington DC, Aurora, Chicago, Chicago Heights, Cicero, Franklin Park & Oak Park, Illinois, South Bend IN. DO NOT ORDER THIS MAGAZINE if you live in these locations. The DMR double mag pouches hold 2 of the Ruger mini 30 20 round mags like they were made for them. If you use one of the molle battle belts or molle vest/chest rigs. There are a lot of the pouches for sale on ebay. Bought two. One worked fine. The other I loaded with Remington ammo. It fed the first round and then jammed. I looked inside and two rounds wanted to feed. Reloaded the mag with five rounds. It fed the first round and the rest ended up pointing straight down. I loaded 20 Tula rounds in the mag and started working the action. It cycles until the last two which are jammed. This mag should never have left the factory. I really like the length of these magazines. Theyre very handy, they dont get in the way when shooting from the prone position like longer 30 round magazines. Only downside is I havent seen a good pouch for them, but cargo pockets work. Nice to have factory 20 round magazines. While I have some really old USA 30 rounders that are reliable, many Mini-30 mags just plain are not worth anything. These are just fine. Reliable, well made and worth all they cost. The mini-30 is my go-to rifle for everthing and always will be! Zero malfunctions, these magazines are the BEST! I TRUST these magazines, plus they dont interfere prone.